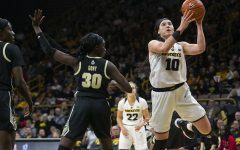 The Hawkeyes got better, but didn’t come out on top against the Illini. 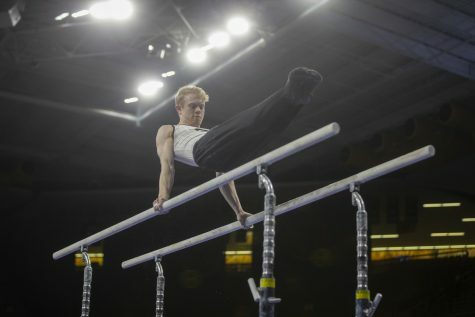 Bennet Huang performs on the horizontal bar during men's gymnastics Iowa vs. Penn State and Arizona State on Mar. 3, 2018 at Carver Hawkeye Arena. 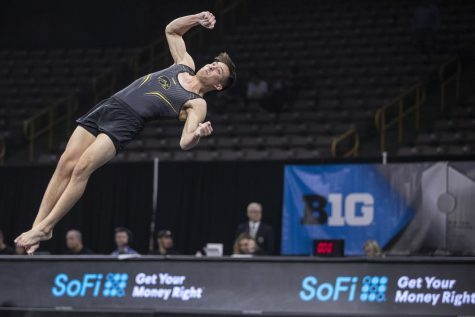 The Iowa men’s gymnastics team showed improvement this past weekend after traveling to Champaign to take on No. 4 Illinois in the team’s first Big Ten matchup. 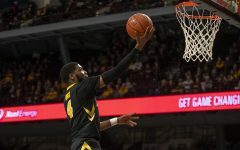 But it was not enough — the Hawkeyes fell, 410.450-398.800, on Jan. 26. 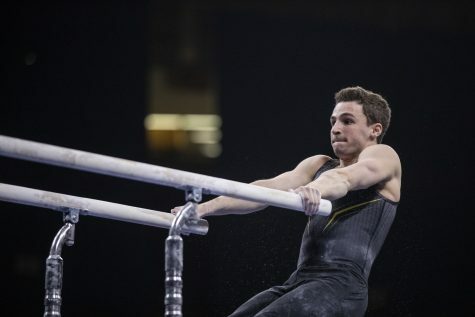 The gymnasts say they will take it one step at a time as they look toward improving. 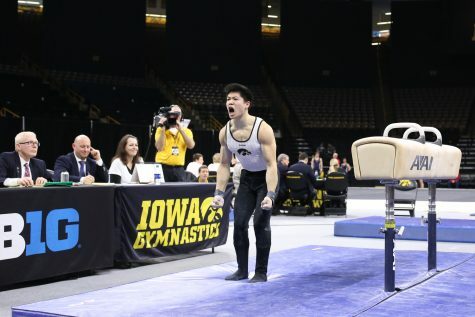 Though the team score did not come out the way the team wanted, some Hawkeyes stood out. 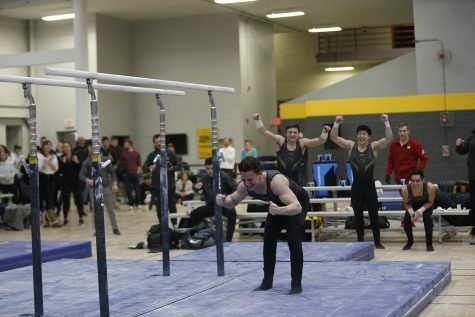 Sophomore Bennet Huang and junior Andrew Herrador took charge, and it showed — they tied for first on the vault (14.550). They were not done there. Huang placed second and Herrador placed third in the all-around competition with scores of 80.150 and 78.700, respectively. 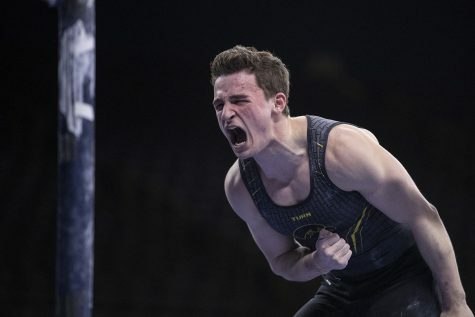 Herrador made a third appearance on the podium, placing second on high bar with a 13.750. 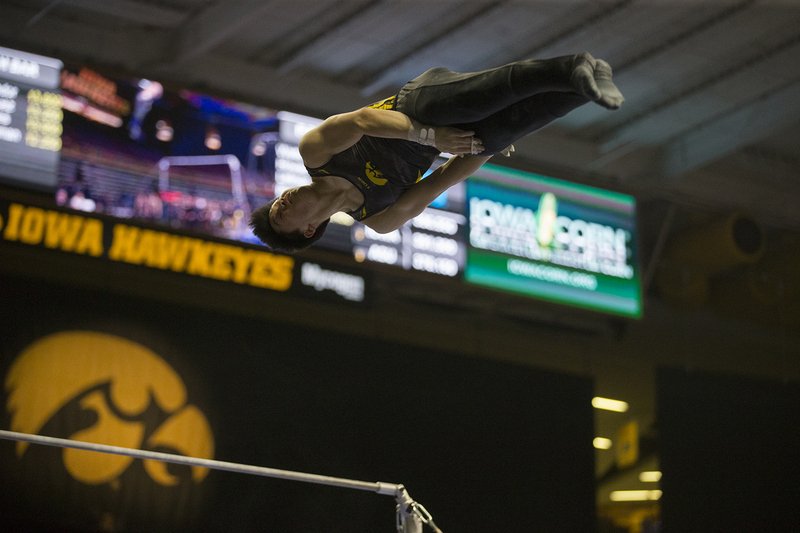 The team started out strong on the pommel horse with each Hawkeye in the rotation earning a season best. Iowa finished with a score of 66.150. 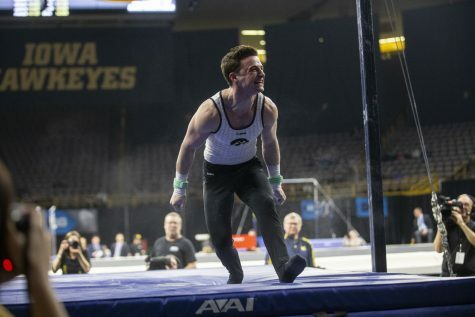 The second rotation sent the Hawkeyes to the rings, where redshirt sophomore Tyler Ball made his début as a Hawkeye. 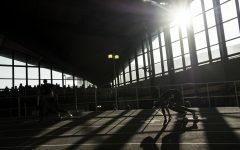 He scored a 13.500 to earn fourth. 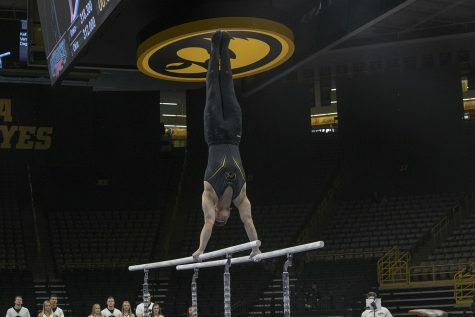 Junior Mitch Mandozzi scored a career high (13.600) and led the Hawkeyes with a third-place finish on the parallel bars. For their next match, the Hawkeyes will head back to Carver to open the home slate against Minnesota and Illinois-Chicago at 2 p.m.